The rustic accommodations and outlying grounds of the Lazy H Ranch – nestled art the foot of Palomar Mountain – are the ideal location for a meaningful retreat experience. Interacting, collaborating, sharing ideas, and making new friends and colleagues will be a natural result of the retreat experience. Group meals always provide lively opportunities for further discussion of the craft of film scoring and current industry trends. We’ll also spend a day on Palomar Mountain where we’ll visit the Palomar Observatory and have class at a cozy mountain lodge. Fresh scenes are handed out each day for you to compose to. Every afternoon, one-on-one mentoring occurs while you are writing so you can revise and improve your work as you go. You’ll learn how to analyze a scene and hone in on the important elements of the drama, how the spotting process works, and effective methods for communicating with the filmmaker. Each day ends with invaluable group playback and discussion of the day’s work. One-on-one mentorship is what sets PFMW apart from other film scoring workshops. The faculty individually mentor and assist each participant throughout the scoring process. Through daily playback sessions you will practice talking about your music, provide constructive feedback to fellow participants, as well as translate the feedback that you receive into meaningful revisions of your cue. Each morning will include a presentation from workshop faculty and/or visiting industry professional. Guest speakers will share their passion and experience on scoring for film, TV, and games; how royalties and the business of music works; how to build, cultivate, and sustain relationships in the industry; as well as professional tips and advice on navigating the Hollywood system. The workshop will culminate with a Hollywood level professional recording session – where the best cue from each composer is recorded and mixed by top LA scoring engineer, Jason LaRocca. You will learn how to create stems and industry standard scores and parts; pre-production tips to get the most out of the recording session; as well as interact with and get feedback from the session musicians performing your cue. Each participant will leave with a powerful showcase scene serving as a substantive addition to their portfolio. Afternoon arrival and check-in at the Lazy H Ranch, orientation and meet & greet, first group playback and discussion, group dinner. Group breakfast, morning presentations by Larry Groupe´and Roger Neill, group lunch, composing and mentoring, group playback and discussion, group dinner. Morning presentation by guest George S. Clinton (film composer), group lunch, composing and mentoring, group playback and discussion, group dinner. Group breakfast, compose and mentoring, caravan to Palomar Observatory and mountain lodge, group lunch, afternoon presentation by guest Garry Schyman (game composer), group playback and discussion, group dinner, return to the Lazy H.
Morning presentation by guest Rick Marvin (TV composer) with live scoring to picture demonstration, group lunch, “my career in 30 minutes” presentation, composing and mentoring, presentation by Steven Wayne Thomas, John Weisiger, and Bill Piyutat H. on session preparation, group dinner. Group breakfast, morning presentation on orchestration for the screen, group lunch, score & stems procedures walk-thru with the “prep team”, composing ends and orchestration/stem prep begins, group dinner, orchestration and stems preparation continues. 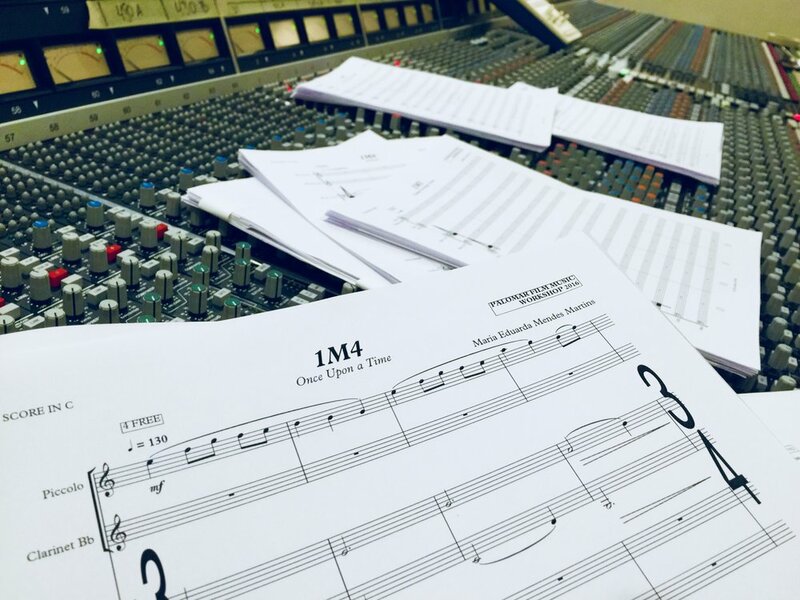 Group breakfast, orchestration and stems preparation continues, group lunch, orchestration/stem prep concludes, scores and parts preparation begins, group dinner, preparation concludes with printing and taping and assembly of the final score and parts. Group breakfast, Lazy H check-out, caravan to recording studio, recording session, group lunch, mixing session, caravan to mountain lodge, playback and wrap-party. Group breakfast, depart for airport and travel home.